As you may recall, I made a poll for 2018’s Lent book. Two books were nominated, but I had a year-long rule of only reading books I own in my spare time. Well, now it’s 2019, and that rule is up. 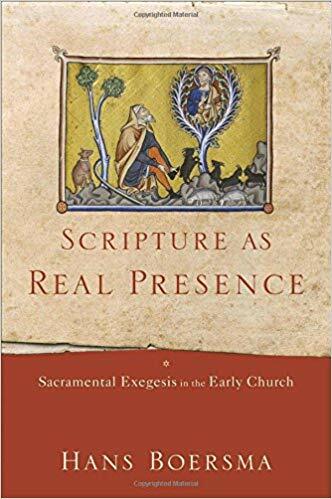 So I have chosen one of those two books, Hans Boersma, Scripture As Real Presence, on the grounds that I live a 15/20-min walk from Regent College where he teaches. Also, I need to get better at reading the Bible. This book should hopefully do that; it is a study of patristic exegesis. There is always the general desire to read the Bible more consistently. But I think that I am bad at reading the Bible. Either I don’t invest enough attention or I don’t really get it. I’ve already read Vaughn Roberts’ God’s Big Picture, a book that laicises the work of Graeme Goldsworthy. But somehow, situating a passage from the Old Testament in salvation history doesn’t always help. So this Lent, I want to read the Bible more. And it strikes me that being equipped to read the Bible better will help. It will also help to re-learn discipline and humility, of course. I’m hoping Boersma will be part of that better reading. I mean, I already know a lot about the topic, but what I really want isn’t just information about how the Fathers read the Bible but how I can follow in their footsteps. This book will hopefully help with that. I’m on chapter 4, about Melito of Sardis and Origen’s allegorical reading of Exodus. The introductory sections of the book were inspiring and meaty, and the chapter on Gregory of Nyssa and Augustine’s literal reading of Genesis was thought-provoking. In chapter 3, about Origen and Chrysostom on Abraham’s theophany at the Oak of Mamre, we encounter two different styles that are to be held in tension with each other but not necessarily strictly harmonised. The underlying conviction of this book, and one that the ancient and medieval exegetes also held, is that Scripture itself needs to be theologically and holistically, and Jesus Christ is at the centre of all true exegesis. God makes Himself manifest to us through Scripture, and we need to prayerfully apply ourselves to it. What I want to know is how Boersma now interacts with his former influences, such as the Reformed tradition and N T Wright. But I do hope his trajectory through the Fathers into Anglicanism will not end with him Roman Catholic or Eastern Orthodox, as happens to so many. This is a readable book, and so far I can heartily recommend it for Protestants who want a taste of the riches of Scripture beyond the sort of historical exegesis touted almost everywhere else.